The Simply Obsessed july kit is here! I came home to find it on my doorstep. Here is a peek at what I will be working with for July. My first reveal for SO will be on July 10th. I already know what pictures I am going to use with this fun Lime Ricky! 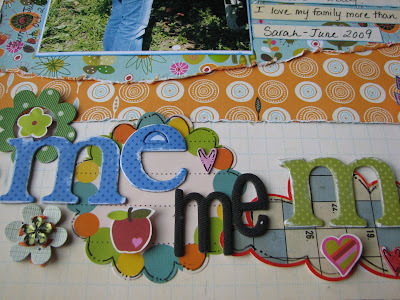 I just finished my A Walk Down Memory Lane July projects. Here is a sneak peek. Check the A Walk Down Memory Lane DT Blog and Gallery on July 1st for my July reveal. My first article will also be appearing in the July newsletter. You can sign up for the newsletter here. 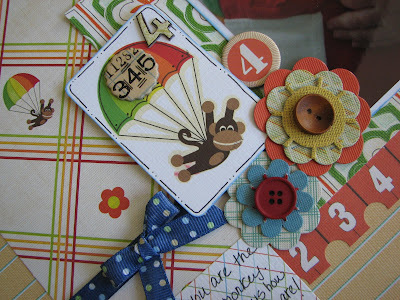 Here is my second June reveal for Scrap That! I love this picture of Frances. I am always trying to take pictures of her. This face pretty much sums up what she is probably thinking- "Why won't this lady ever just let me play?" Not sure what I want to use this card for yet, so I left the sentiment off. Just a quick card, nothing fancy here! I made this bag playing around with my cricut! I was trying different sizes and shapes. I think it turned out just ok, but I have a better idea of how to use my cricut now. It is pretty small, perfect size for a gift card. I can give it to my mom. Whenever things don't turn out how I like I give them to my mom. She loves everything I make. You gotta love moms for that! Tonight I will be working on my first set of projects for A Walk Down Memory Lane. I will give you a hint of what I will be working with- The Early Bird gets the worm. Get it? 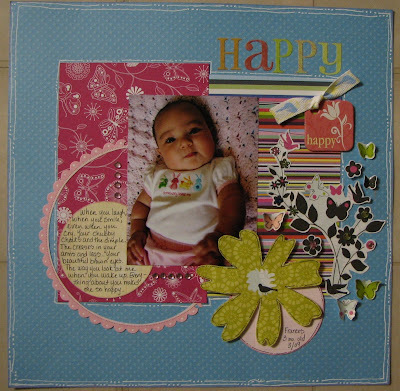 I finished my first two layouts for Scrap That!. 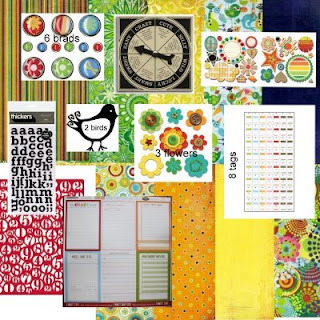 In this month's kit we were given some fun colorful embellishments and papers that are perfect for summer. I have a few more projects in the works so please check back soon! Wow it has been a crazy week. I can't believe it is Wednesday already! First I had my all day crop on Saturday which was lots of fun as always. Then Sunday I ran in a 5k race, went out for Father's Day lunch and then to my Aunt's wake. I was also gone all day Monday at my Aunt's funeral. 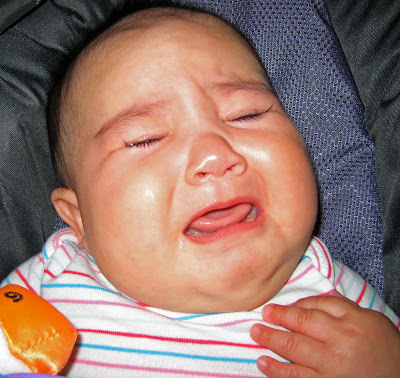 My poor Frances cried all day Monday when I was gone. I felt terrible. My mother in law was watching her and said she hardly ate at all. Poor thing ate a ton when I got home at 6pm and then feel asleep for the night. I also decided this would be a good week to start giving her a bottle. I am starting with one bottle of formula a day. Yesterday she wouldn't eat it at all. Today she did pretty good though. I had tears in my eyes both days trying to give her the bottle. I think I was more upset today when she actually drank from it. I just can't believe how fast she is growing up and that one day she won't depend on me for everything. Other than that I have some good news- first of all I was asked to design for Simply Obsessed! I am so so excited. I love the message board, everyone is so friendly and the kits are AWESOME! Second I was asked to be a guest designer for Scrap Tiffany a new kit club that just started. My guest month will be in November and I can't wait. Tiffany has a really fun blog and I know her kits are going to be great! My DT kit from Scrap That! just came yesterday and I can not wait to play with it. I uploaded all my pictures to Wal-mart last night and went today to pick them up. I got there and the guy said we don't have an order with that name. Of course I told him I ordered last night, it should be ready now, I paid with Discover, etc, etc, like he couldn't possibly be right. Again he told me no order. I called my husband and he checked online. I was at the wrong Wal-mart. Doh! So he is going to pick them up on his way home. Also I just received confirmation that my kits from the Scrappy Shack and A Walk Down Memory Lane have been shipped. I am going to have lots of goodies to play with! Hope everyone had a good Wednesday! I spent it in the pool with Frances. Here are some pictures from the last couple days. Me and France before Sunday's 5 K.
Me with my participant ribbon after the 5K. I didn't do that well, but I did have to get up early to nurse a 6 month old. How many other runners can say that? Frances giving her Daddy a kiss on Father's day. 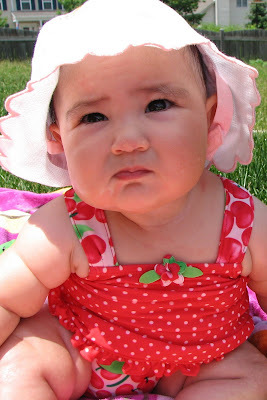 Frances in her Cherry Bikini and sun hat. How cute is this? Happy Tuesday everyone! It is a sunny 95 degrees here! I can't wait to get Frances in her swim suit and in the pool. I have been imagining the pages I would make of her in that suit since the day I bought it! I spent Saturday at an all day crop and got lots done. 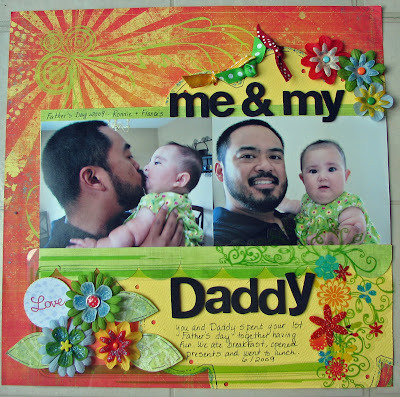 I worked on Frances's 8 1/2 x 11 calendar album, finished my July challenge for Butterfly Crafts, which will be posted on July 1st, and got two pages done of Frances for her 12 x 12 album. Here are the two layouts I finished of Frances. I just love her smile in the second LO. The first is from her first Easter. She didn't really care about her Easter Basket and kept looking away while I was trying to take the pics! I am happy to announce that I am now designing for A Walk Down Memory Lane! It is an amazing store with so many great products. Each month they sponsor a new manufacturer and merchandise from that manufacturer is on sale. Who doesn't love a sale? 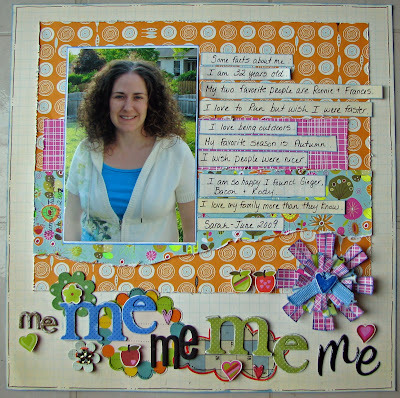 June's featured manufacturer is Doodlebug Designs. So come on over and check out all the fun new Doodlebug goodies. A blog award for me! 1. The sun is out! Well at least for a little while. Some nasty thunderstorms are coming our way. 2. I made a new design team, but can't tell you which 'till Monday! Stay tuned! 3. I received my first blog award! 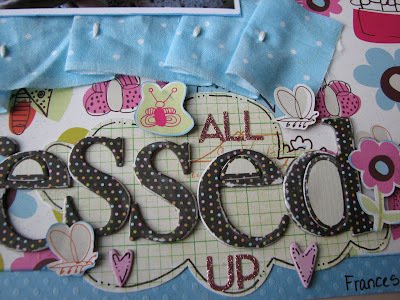 My fellow scrapper and DT gal over at Butterfly Crafts Marlene gave me this awesome blog award. How sweet is she? I couldn't be happier about it! She's one talented scrapper too so check out her blog! * Accept the award; post it on your blog together with the name of the person who has granted the award, and his or her blog link. * Pass the award to 6 other blogs that you’ve newly discovered. Remember to contact the bloggers to let them know they have been chosen for this award. If you can’t pass it on to 6 just pass it on to as many or as few as you like. So I am passing it on to these lovely, talented ladies, whose blogs I have been enjoying the last couple of months. Have a great weekend everyone. I won't be around much. I have an all day crop on Saturday (hoping to get lots done!). On Sunday morning I am running in my 1st 5k race since having Frances and in the afternoon meeting my family for an early Father's Day dinner. Sadly, my Aunt died Thursday of Pancreatic cancer (she was only 62) so I will be attending her funeral on Monday. I am ok though, just giving Frances tons of extra hugs and kisses to cheer me up. Well enough time has gone by that I can post my layouts that were published in Ready, Set, Create! "I hate tummy time" is one of my favorite lo's. Doesn't Frances just look so cute here? She still hates tummy time, but is getting better. She can sit up now so she would much rather sit up and play than be on her stomach. She is just the siliest little girl. She makes me laugh daily. I already told you she thinks she is a dog. I am just waiting for her to bark! Her new thing now is to laugh at all the monkeys on the wall in her bedroom. It is so funny. I will be nursing her and she is almost asleep, eyes closed, quiet and then all of sudden she will open her eyes, turn her head and look at the monkeys. Then she starts laughing. It is so funny. These other two layouts I posted, but then took down a day later when I found out they would be published. So I am going to post them again. I can't believe Frances was ever this tiny! Look at those skinny little feed and ankles. Now they are filled with so many rolls! Everytime I look at this LO it makes me happy inside. So I guess I picked a good title huh? Journaling: When you laugh, when you smile, even when you cry. Your chubby cheeks and the dimple. The creases in your arms and legs. Your beautiful brown eyes. The way you look at me when you wake up. Everything about you makes me so happy. TEETHING! Poor Frances. She has has a stuffy nose and is drooling like crazy. I see a little white tooth trying to poke its way through. Hopefully she won't be a biter- YIKES! I feel so bad for the poor little girl. This has pretty much been my week- non-stop rain, a crying baby and three wiener dogs that bark at every little sound. I am going to be glad when Friday is here! I haven't had a chance to scrap all week. My cricut was delivered on Monday and I still haven't even opened the box! Challenge 14 is up at Butterfly Crafts! Your challenge this month is to scrap a childhood fear. Maybe it's something silly from your past that makes you giggle now or something that still haunts you. Go to the blog to see how the DT rocked this challenge! They did some amazing work for this one. 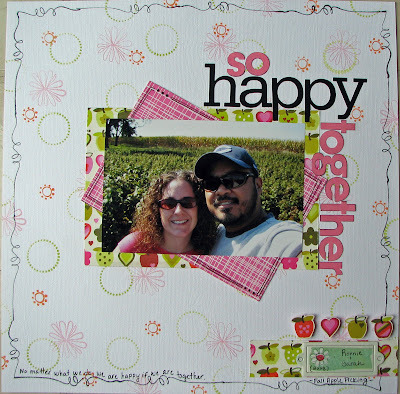 As part of Simply Obsessed's online crop they have an inspiration challenge going on. 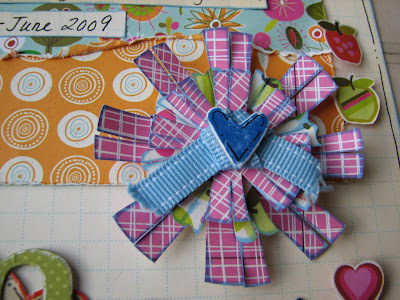 The challenge is to use something as inspiration for your scrap project. I frequently use Frances's clothes for inspiration. I find some really cool color combinations and patterns from her clothes. I also like the cute sayings on them. 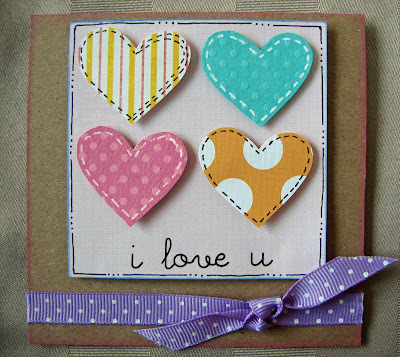 The make for some really cute titles for LO's and sentiments for cards. For the challenge I chose this t-shirt as my inspiration. Look at her arms in this pic! They look so chubby. My husband calls them the dinner rolls. He says they look like rolls that are stuck together in clear plastic bag. He carries her around and says "Dinner roll anyone?". Then he pretends to pick one off. It is so funny. And she just laughs. And here is my card. I drew a heart on a piece of cardstock, cut it out and then traced it onto my patterned paper. 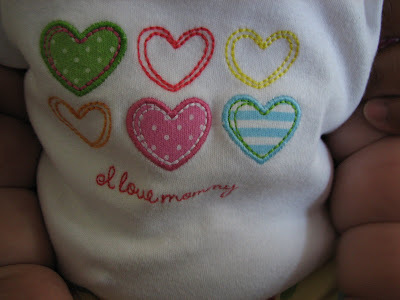 The hearts were a little small to hand stitch or run through my machine so I did some faux stitching with a black pen. I am so glad it is Friday. And for once it is not raining here! It is actually sunny and 75 degrees. Frances and I were cooped up in the house most of this week due to the rain. I can not wait to get out and have some fun outside. Yesterday we didn't even leave the house once. She was so cranky. I found the only way to entertain her was by sitting her in the exersaucer and doing little dances. She has a thing on the exersaucer that when you push a button a song comes on. There are five different songs. So I have a different dance I do for each song. I feel like one of those little dancing monkeys- DANCE MONKEY DANCE. I wonder if that's what she says in her head? Anyway, I stay still and when she presses the button she just laughs and laughs when I start dancing around. We did that for hours yesterday. Wednesday was our last day of Music Together, the baby music class I take her to. I really think this class is the reason she likes music so much. Here are some pictures from her last day of class. She's so cute playing the bells. But soon got tired of it and decided the stick thing (what do you call these things?) tasted good. I also worked on a few new layouts this week. This one is Frances's four month picture. I chose the title "Chubby Little Monkey" because well, just look at those arms. I think they say it all! This is my current favorite picture of the girly. As you can tell above! 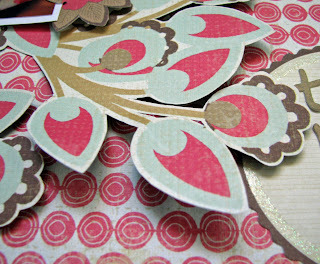 This LO was for a stamping challenge over at Simply Obsessed. The challenge is to use stamps to make your own patterend paper. 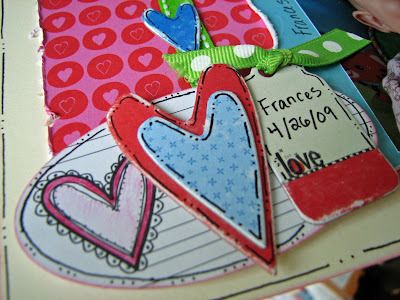 I used my new Heidi Grace stamps to stamp on the white cardstock and stamp the border. I didn't know how it was all going to look together, but I think it turned out cute. I especially like how the title turned out. I just got back from buying Frances a little kiddie pool. I can't wait to take some pictures of that! She has a Have a great weekend! 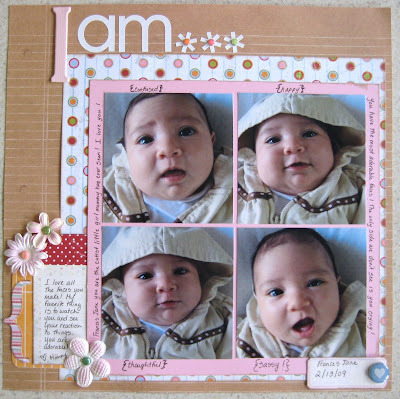 Two new layouts and One cute baby. So Frances did it again today. She licked me! Several times actually. It is really funny when she does it. She seriously thinks she is a doggie. I was watching her today too and when our dog Kody walked by she stuck out her tongue. I think she was waiting for her doggy kisses! She is such a goofball. She has a funny personality already. And she is only 5 1/2 months old. 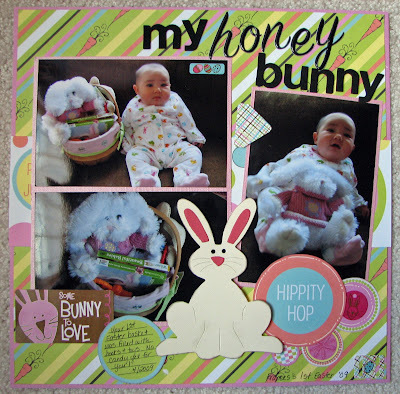 I was scrapbooking on Saturday and Ron took some pictures of her playing. These were some of the funnier ones. And here she is playing in her new exersaucer. She loves this thing. When the music plays she taps her feet to the beat. It is so cute. Here are the layouts I finished Saturday while Ron was playing with Frances. I am lovin' how stickers behind my titles look. I did it on my "Dreams" layout because I needed something to help the title stand out a litte more and liked how it looked. I did it on these two layouts too. 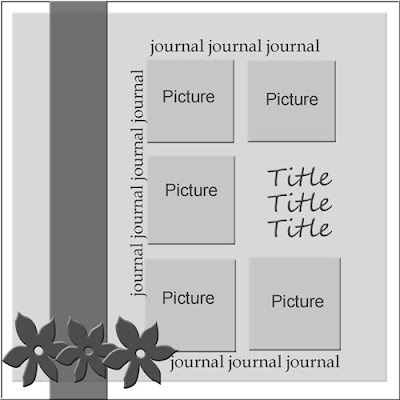 And I have been adding some cute embellishments around the titles to make them stand out. "All dressed up" is based on sketch 22 from 52 weeks, 52 sketches. I had fun with this one. I love the new K & Co. Greenhouse papers. They are full of flowers and other cute things. This LO is about, you guessed it, me! I usually don't scrapbook myself, but I love how this turned out! And I am sure Frances will get a kick out of looking at this one day. I couldn't decide on a photo so I chose this one of me apple picking. It shows me doing something I love so I thought it fit the page. I also liked the apples on the paper so that was a bonus! I used my greenhouse papers on this one as well. I also made one of the flowers from the tutorial I posted last week. I couldn't think of a good title for this one so I chose "me, me, me, me, me". I have actually gotten a few good comments about that title! Haha! 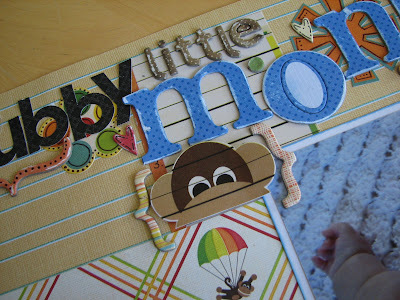 And this made my day- Two of my LO's, "Good Morning Sunshine" and "At This Moment"(called "Baby" on the site) were added to the GCD gallery on scrapbook.com! You can check them out here. Frances you are not a doggie! I am pretty sure Frances thinks she is a dog. For one thing she is obsessed with the dogs. She watches them all the time and always wants to pet them. I feel bad for her because they run away any time they see her little hand reaching out. What they do love is to lick her though. If I even turn my back for a second there is a dog tongue licking her little face. So now when I hold her she starts licking my face! The first time it happened was yesterday night. I almost died laughing. She just opened her mouth and stuck out her tongue. Then she kept doing it today when we were out for lunch. It was too funny. Before Frances was born I made her a little book called "I am a good dog". It only had pictures of Bacon and Ginger because Kody runs and hides every time the camera comes out. Bacon, Ginger and Kody, my three dauchunds were all rescued from dauchshund rescue. They were all abused by their previous owners. It makes me so sad to even think about it. But we spoil them so much now we hope they don't remember it ever being any other way. So if Kody doesn't want his picture taken I don't make him. So I made this book for Frances and I am hoping she grows up to love dogs as much as I do. I have so many "doggy" layouts I tried to make use of some "non-dog" paper on this one. I just love this acrylic dog bone book. I was going to cover all the pages in paper, but then thought why not just use a chipboard album then? So I tried to line everything up so you can see all the papers through the pages. I have just posted a few of the inside pages as they all follow the same layout. We love to sit in the sun. It feels nice and warm. Being a good dog makes me sleepy. Time for a nap. I am happy to announce that I have been asked to join The Scrappy Shack's first ever Design Team! Lori, the owner of the scrappy shack, designs these incredible one of a kind die cuts. When I saw the design team call I checked out the site and loved all her designs. I really wanted to be a part of this DT so I was super excited when Lori emailed me to give me the good news! 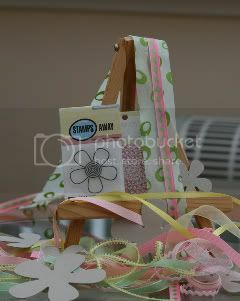 Starting in July I will be designing with The Scrappy Shack products. I will also be a featured blogger on The Scrappy Shack blog sometime during my term. Hope everyone is having a great weekend. This picture about sums up my weekend so far. There's never a dull moment with Frances around! I can't believe how fast time is going by! It seems like just a few days ago baby Frances was born and doing nothing but sleeping and eating. Now she is into everything and almost crawling. Yes crawling! She almost has it and she tries to chase the doggies, but isn't very successful. This is an old LO I did when she was 2 months old. Look how cute she was with all that hair! Too bad that it all fell out! I had a new series of pics of her at four months that I wanted to scrap. I wanted to make the page similar to the "I am" page to show how much she has changed. So I created my first sketch to help me! Ok so I am just learning photoshop so this is pretty basic, but it helped me lay everything out on the page. Here is my take on the sketch. Isn't this just the cutest baby? I think this may be my new favorite LO! After laying everything out I didn't think flowers would look right so I changed those to hearts and used some ribbon for the strip down the left. 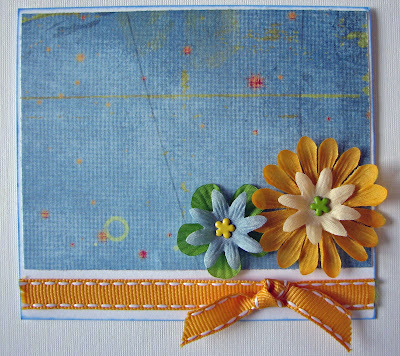 I am also hosting a sketch challenge at Scrap That! for June. 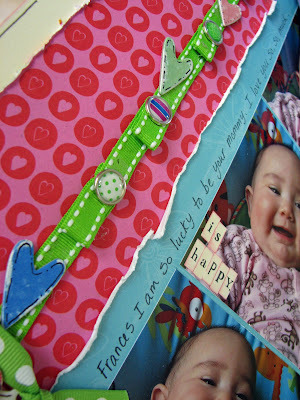 Use the above sketch to create a LO and upload it into the Scrap That! gallery by June 30th and your name will be put into a drawing for a RAK from me. The other DT girls have some great June challenges going on too so stop by and check them out. A few weeks back I wanted some flowers for my "I Love Being Your Mom" page. Of course I had every color, but the color to match my LO. So I made my own. Here are the directions so you can make your own. 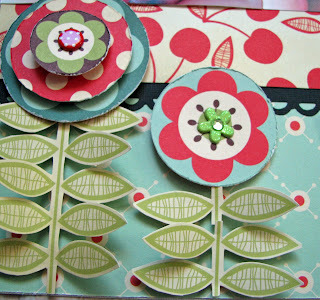 These are great for using up left over scraps too! I used my left over GCD paper. I didn't want any of that beautiful paper to go to waste! Sorry about the pics it was raining here when I took them (so what else is new?). If you make them I would love to see them! Comment with a link to your blog if you like so we can all oohhh and aaahhhh over them! Step 1: Punch or cut 1 large circle and two small circles. Step 2: Make four cuts on circle as shown below with my pencil lines. Step 3: Make four more cuts in between your previous cuts as shown below. Step 4: Cut a small triangle out between each of the cuts. Don't worry if the triangles or cuts or uneven. When you start layering everything you won't be able to notice. Your circle should look like this! Step 5: ink all the edges. I try to get in between all the cuts too so they really stand out. Step 6: Repeat cuts with other two circles. Step 7: Layer the circles and adhere with pop dots. Step 8: Add ribbon and button. Doodle if you like! Step 9: Curl edges of the paper. Step 10: Make them your own! Add any other embellishments you like! Lots of Snuggles and some exciting news! 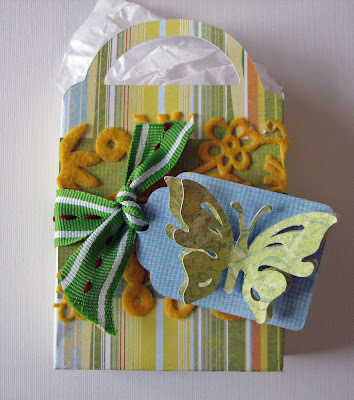 June Reveal at Butterfly Crafts!